Facebook is one of the entertainment media in which you find a lot of common people active. Apart from entertainment, people use Facebook as an effective communication and advertising channel as it generates noticeable leads and conversions to your product or brand. With this aspect in mind, all the newbies and even the experienced business magnets show interest on having their own Facebook page. Realtors also are in the list! 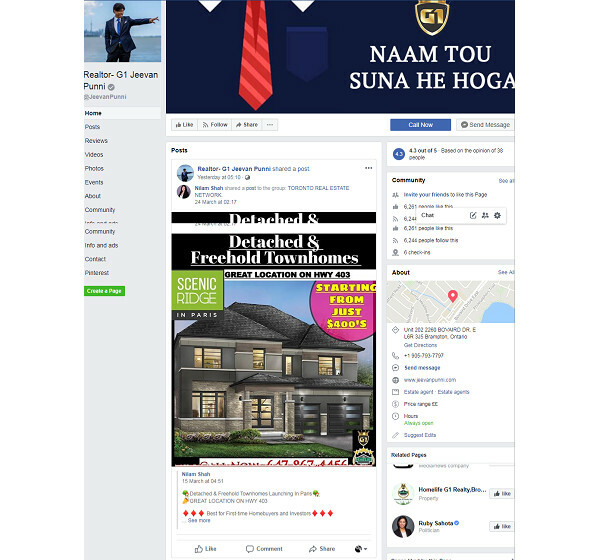 For real estate agents who wish to have an interactive Facebook page and build effective connections with the potential audience, here we have showcased the step by step process of creating Facebook business page. Let’s pay heed to it! This is first and the most probable thing you do on any other medium. 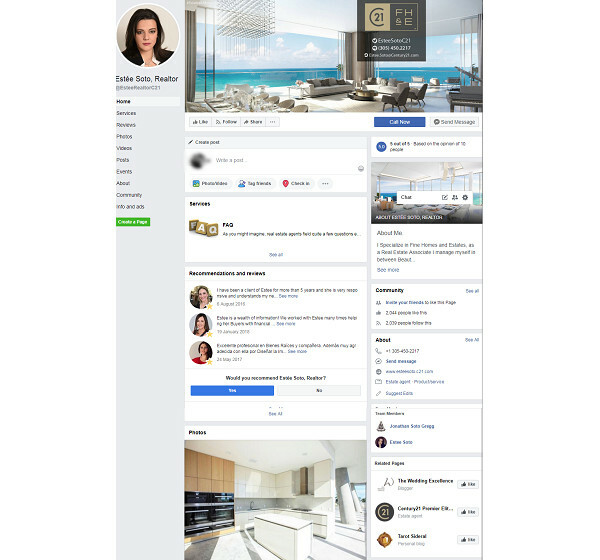 As a real estate agent, you might have Facebook account already. But for creating a page for your professional use is something you should separate from your personal use. 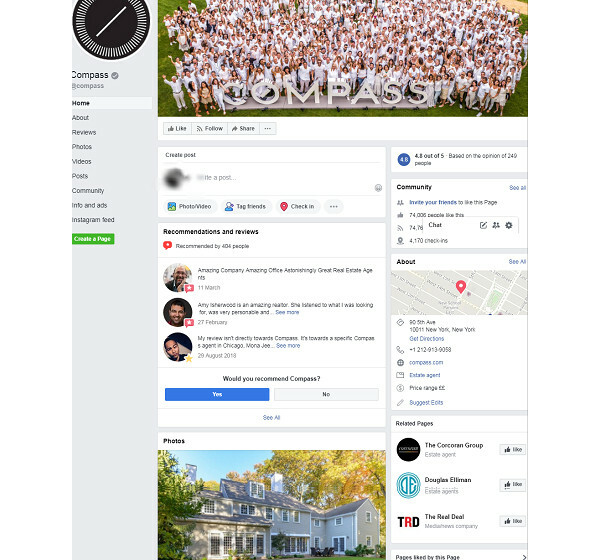 You will find business oriented insights, categories and maps in the Facebook page to help local people find your agency. Under the Facebook signup column in the Facebook page you will find a hyper text withe term ‘create page’ for celebrity, brand or business. By clicking the hyper text, you will be navigated to ‘get started’ page. You will have two options from which you need to choose the brand or business tab. In this stage you need to add the basic information about your business like contact details, website, phone number, etc. You need to name the page as relevant. Once you are done with adding basic information about your business, you need to upload profile pictures describing your agency name. For cover picture you have three formats like photo, video or slideshows, from which you can upload one. You can use generic concept of real estate for cover picture. Here is the major section which helps you connect with the potential buyers. You need to add details such as description about your service, categories like tags and the like. You also have options to edit it anytime. Call to action is considered to be the soul of your Facebook page. Apart from your basic details, your audience look for approaching you to make a deal. In order to get them on your platform you have to give add call to action button on your page. This helps them reach you. You will have multiple choices for call to action button like call now, contact us, message us and more. You can use one from them. You will find the section ‘write post’ to create a post. Initially create a welcome content and share it with your close circle. You get increased followers by inviting your friends, co-workers, professional groups and people. Promoting your Facebook page is a thing you need to follow regularly. Constant updates of content, creating Facebook campaigns and uploading personalized videos are the things to do while promoting your page. Apart from getting likes, there are much more qualities to meet the professional criteria. 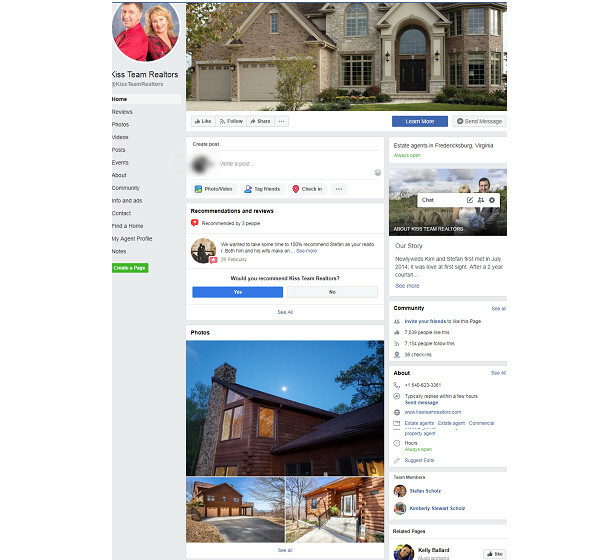 Debra Ross’s page has got all the features to stay one of the top realtors in Facebook. She has 5 stars from 15 reviewers. She is upfront with her listings, this brings her potential leads and attention. Keeping quality with different formats make her posts engaging. 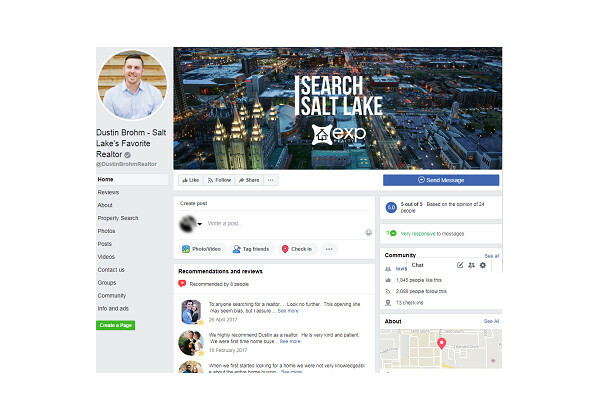 This is the page of Dustin Brohm, who proclaimed himself as Salt Lake’s Favorite Realtor. This is a best strategy to attract buyers and make the service popular. 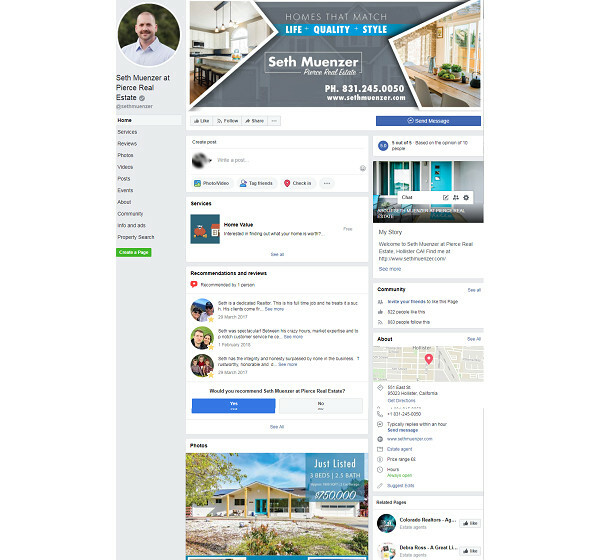 If you are newbie for real estate business you should get inspiration form Seth Muenzer’s Facebook page. He has started off his post very attractively to get buyers’ attention. He has made a lot of strategies on his page. A group of realtors has started off this page to get potential buyers. They have been using different strategies to get the buyers attention. The team often shares events and shows support they are getting. You can get their reputation just by reading the blissful comments registered by buyers. 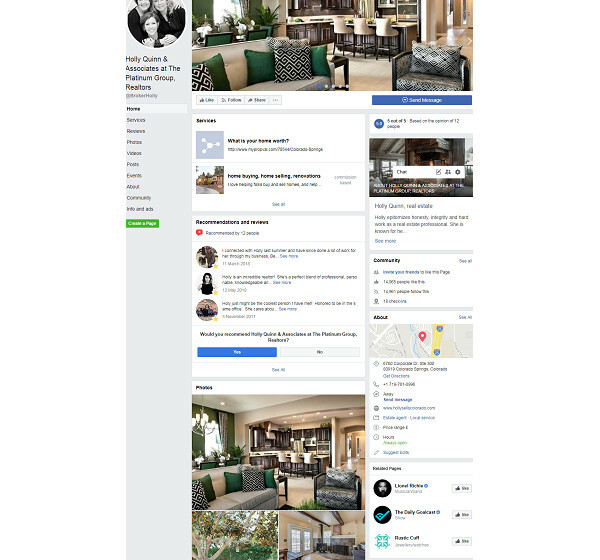 This is the page of Kim and Stefan, who have started this page for promoting their real estate marketing agency. They are upfront with all the listings and you can get their updates by scrolling their page. With numerous posts they have posted so far, they are keen in developing the reputation. 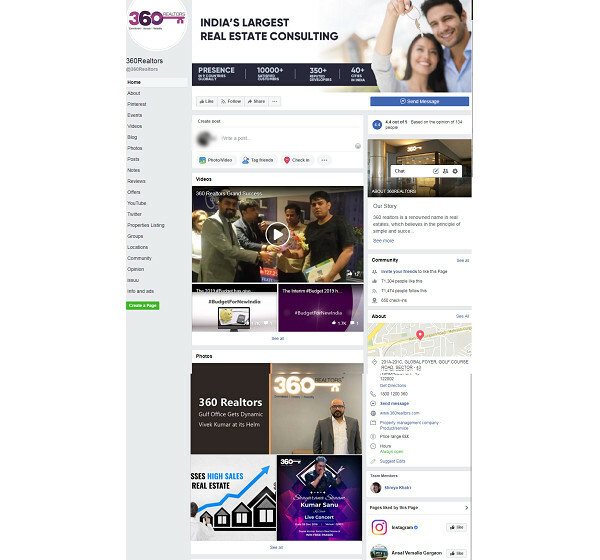 360 Realtors have got 4.4 out 5 based on the people’ reviews. They have set out send message option for call to action button. 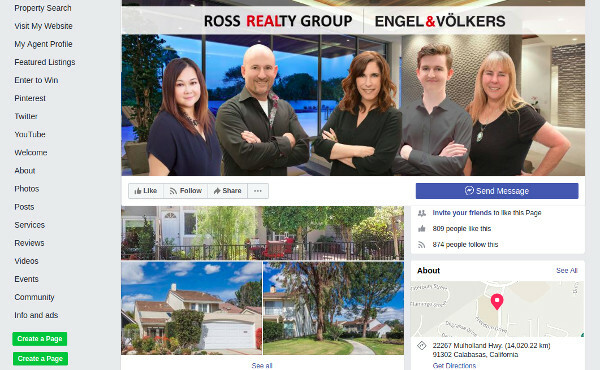 They have already earned millions of followers so they constantly update their listings. Jeevan Punni has got 4.3 stars out of 5. As a single realtor he accumulated a lot of followers, this must be appreciated. The successful campaign he runs can be the reason for his huge followers. Just to follow a different strategy of the campaign, here, it was mentioned the services he provide on real estate domain. The realtor has proclaimed himself as selling agent, buying agent and more. As a single realtor, she has got five stars out of five. She used Call now button in call to action section. She has shared more of her personal visits to the property, this earns a good name. 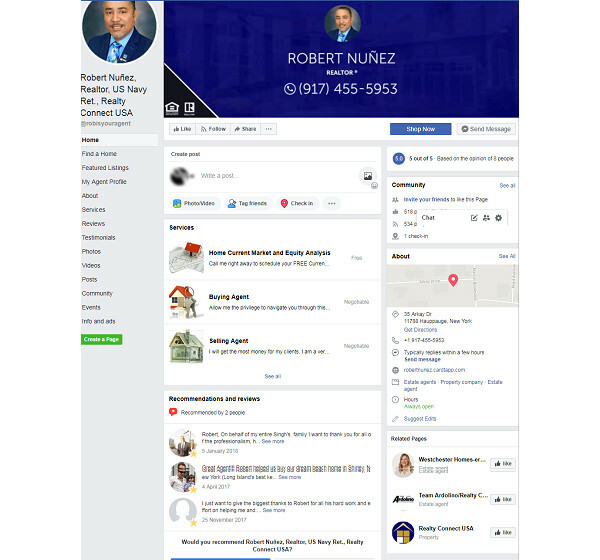 This is a group of realtors working towards promoting the page and service. This is a best example for those who has been working as a group in real estate business.